Back in 2014 the new storage yards were created as a 9-road dead-end arrangement, and here are the yards waiting to be populated. The original thinking was that the kick-back roads in the bottom right would hold the DMU rakes, but in reality, they ended up holding spare locos. 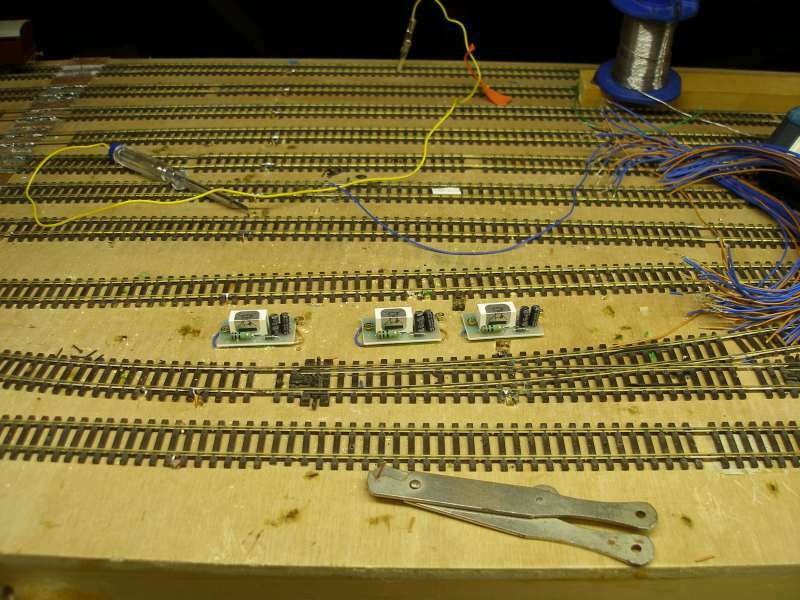 Note how all the points are worked by DPDT switches which both lock the point blades and switch the live frogs. 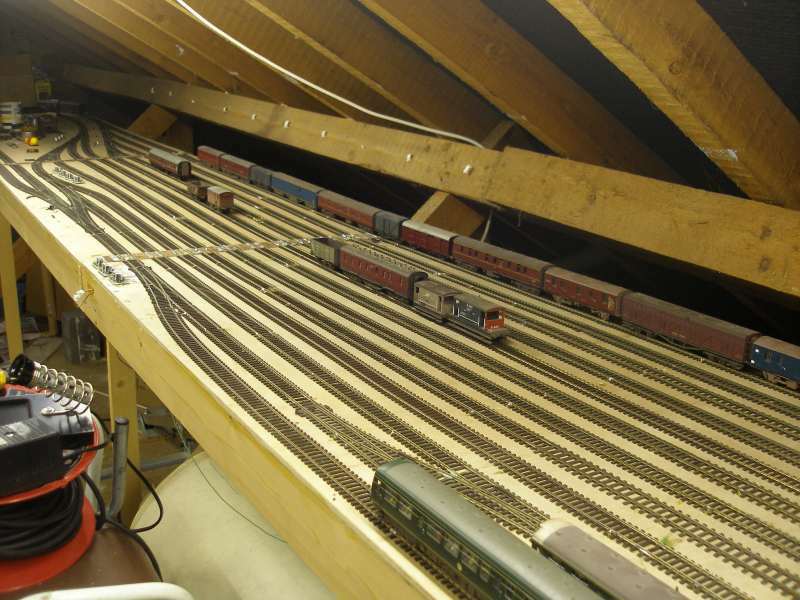 The first major change was to make the yard double-ended to form a continuous run. This meant that at a stroke the 'through' roads were shortened, and capacity significantly reduced. And, of course, when trains were running through the yard, an Up and a Down road have to be kept clear. Also, the DMUs were tending to be held on one of the main loops, which meant that a sandwich of units formed, with the units in the middle were effectively marooned. A rework was required, and it was decided to increase the number of through roads, and increase and improve the DMU stabling area. This next two photos show early progress, with the new pointwork in place, and the roads to be reworked lifted. on the first couple of boards, as at 30 May 2018. On 4 June the new track is still inching its way eastwards. As can be seen, three roads have not been lifted, and the extra tracks have been laid between them. 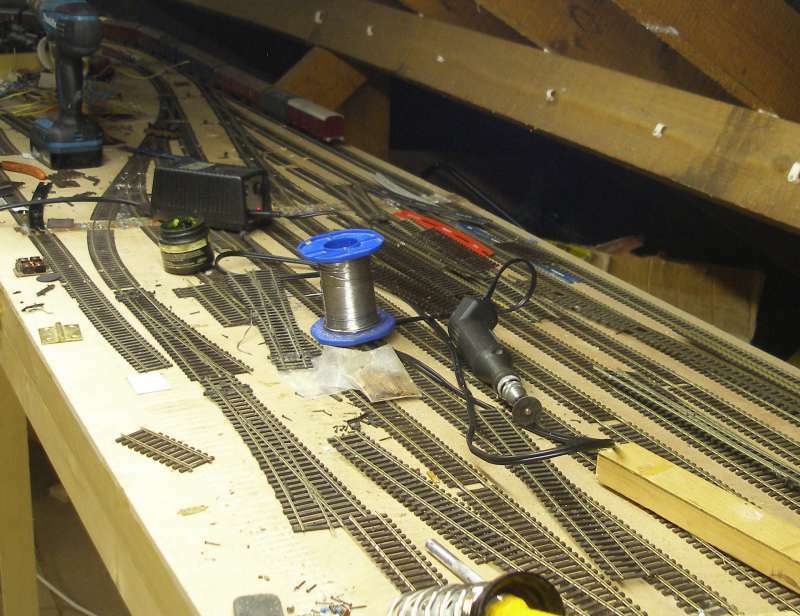 On the 13 June the basic track laying is complete, and now the slow process of fitting the droppers has started. 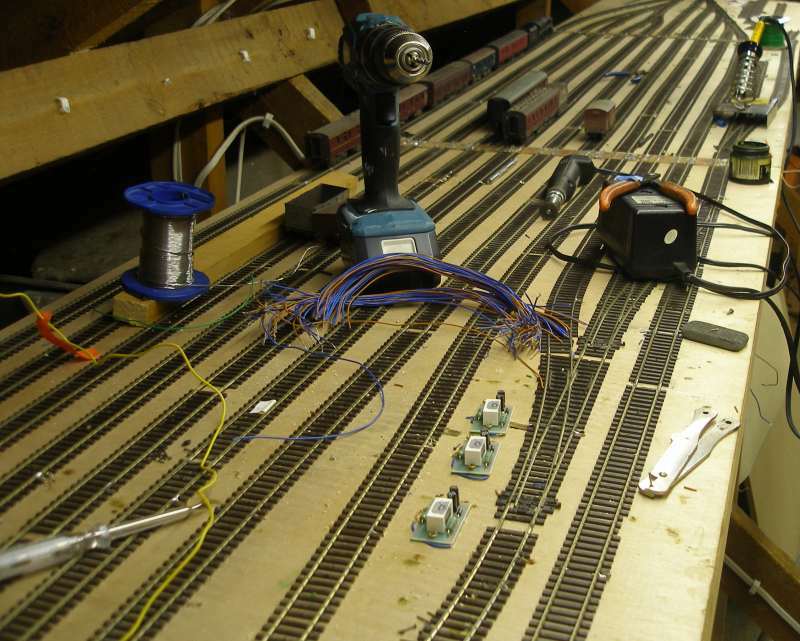 The new arrangement now uses Peco points exclusively, with the frogs now switched using Gaugemaster DCC80 units. 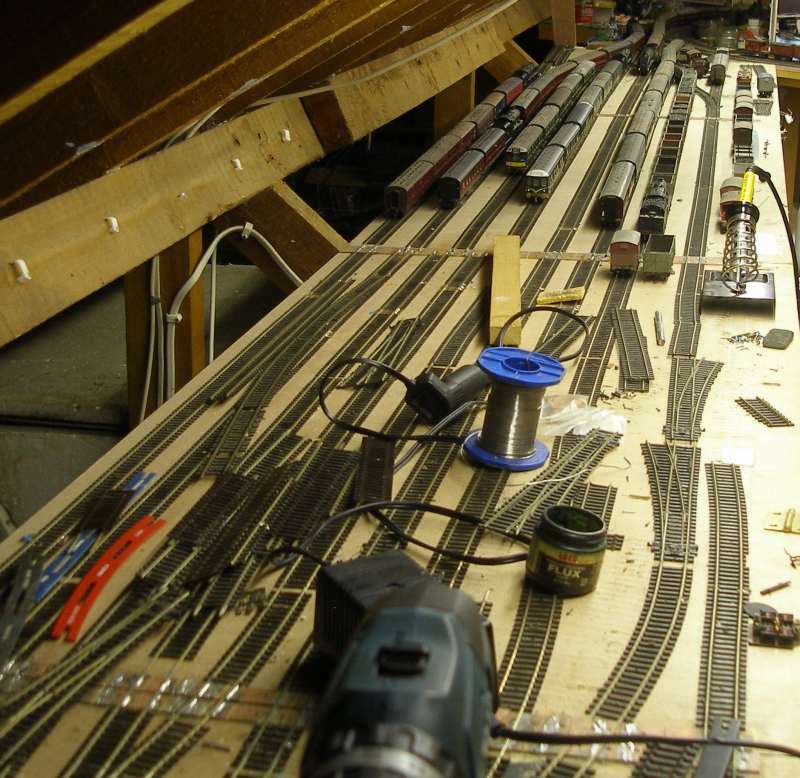 Starting the fan of tracks earlier has created longer roads, but some space has been lost due to having to avoid placing a point over a baseboard joint. Despite all the advice not to do this, I did try laying a point over a joint on a previous layout, which was a devil to align correctly, so this time no space saving wheezes. 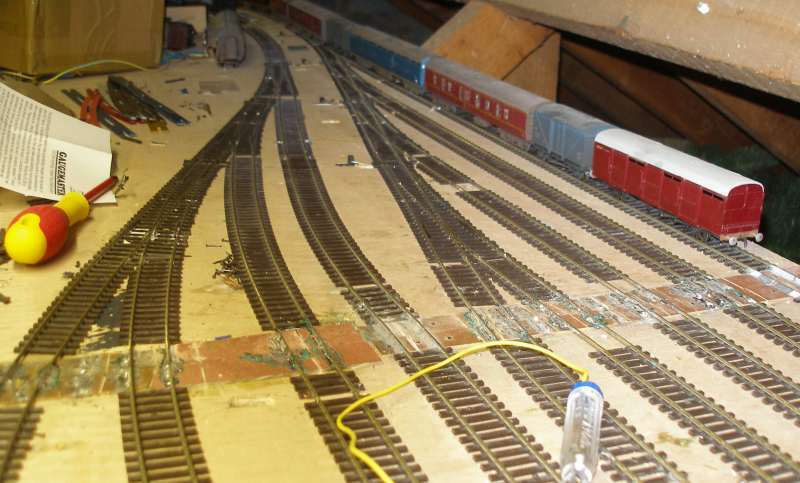 Finally on 13 June the new layout is complete, and trains are starting to be stabled. 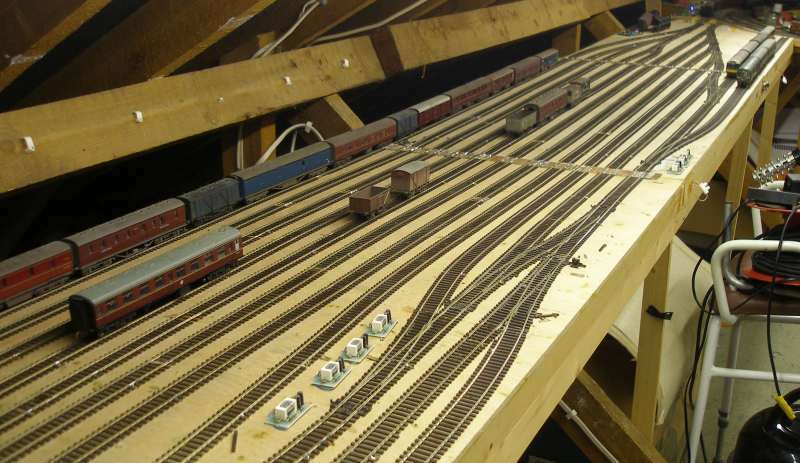 Note how the DMU are stabled in two sets of facing sidings so that they can be quickly formed into 2-; 3-; 6-; 8- or 9-car formations.